Craigslist Search Tips - Find what you are looking for faster. 1. K.I.S.S. (Keep It Simple Stupid): Craigslist is the wild west of classifieds, they let anyone post items for sale and they don't require most information be filled in. So when searching for a car most of the fields (Year, Make, Model, Engine, Transmission) are never filled out. 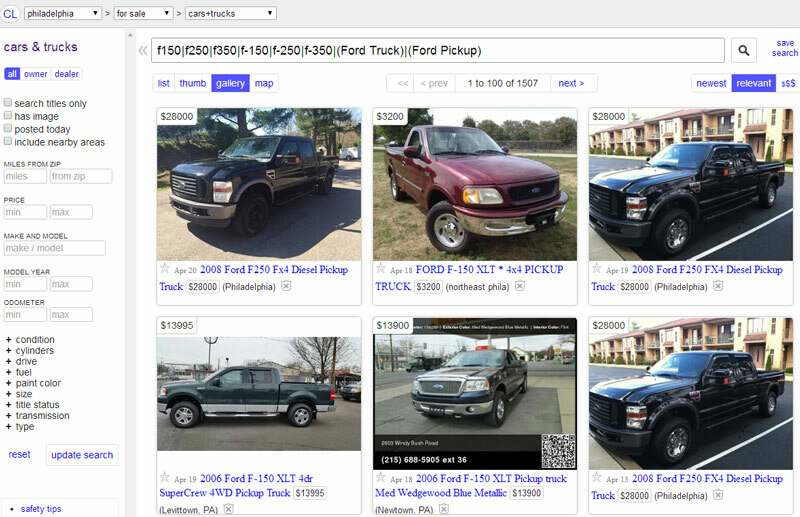 So you could go crazy with the search filters and start searching for a 2000 - 2005 Ford F-150 with a 6cyl engine and manual transmission and come up with a limited selection because only 25% of the people actually filled out all the details of the vehicle they are listing. In this case K.I.S.S. and don't filter right away by transmission or engine. Year is usually ok, but not always. 2. Misspellings: Again, they let anyone post, so you will get some keyboard cowboys with poor spelling and grammar, what can you do? Think about possible misspellings, abbreviations and slang for the product you are looking for. Searching for a truck, make sure you search for "pickup" as well. 3. Wild Cards: An asterisk can save you time. "fo** truck" matches "ford truck", "food truck" and "foul truck". Helpful in catching some misspellings. 4. Categories: When looking for a car or truck you would think it's best to search in "Cars & Trucks" but believe me, there are cars and trucks in other categories like "Business", "Farm+Garden", "Auto Parts" and even "FREE" categories. Consider doing a search in the general "For Sale" category to catch everything. Notice the () around the search terms that have a space in them. This is required in regular expressions as the space is interpreted as the end of the statement unless it's encapsulated in parentheses. 6. Get an APP: Not going to recommend a specific APP as they come and go, but there are some good apps out there which allow you to get alerts when new items come up for sale on Craigslist. They also allow you to search multiple regional Craigslist sites at the same time. A word of caution to those attempting to use Craigslist for arbitrage or "flipping", most APPs use the RSS feed from Craigslist which is not always updated in a timely manner. You will always get the latest items by searching the live site. If you are looking for a good deal, it may be gone before the RSS feed updates. This delay in updating the RSS feed can be 10 minutes to an hour in my experience. PS: I have created a video version of this page for those who would like to see these tips in action.